Bull kelp (Nereocystis luetkeana) forms dense marine forests that provide protective habitat for many species of fish and invertebrates, including salmon and herring. Kelp also fixes carbon and makes it available for a wide range of grazers and decomposers in the marine food web. Bull kelp plants consist of a base or holdfast, a long stem or stipe (3-20 m) that ends in a bulb or float. Extending from this bulb are many, long blades that produce and release spores (from sori or reproductive patches). Like an annual plant in the garden, bull kelp lives for only one season in this large (sporophyte) form. It matures in late spring to summer and is washed away by storms following the release of its sori. Spores germinate into microscopic forms (male and female gametophytes) that release gametes. Following fertilization, a new sporophyte generation begins in winter to restart the annual cycle. Despite their high reproductive capacity, bull kelp beds have been in steady decline in central Strait of Georgia, including Lambert Channel and Baynes Sound in recent decades. Heavy grazing pressure from sea urchins and exceptionally warm water conditions are major factors in the reduction of bull kelp beds locally. In 2011 the Nile Creek Enhancement Society started a kelp project to investigate this phenomenon and to see what could be done to stop this decline. 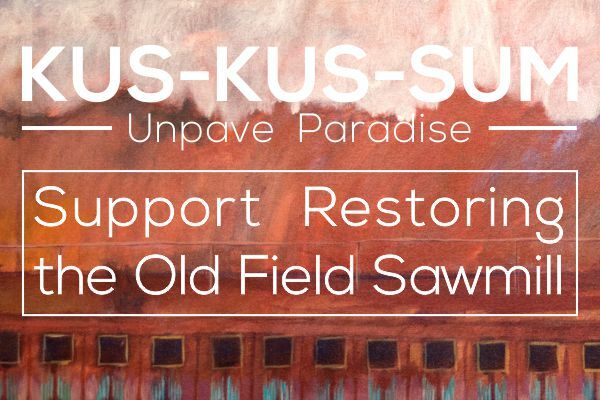 The project initially focused on bull kelp bed restoration through physical seeded line outplanting at the experimental culture site (Maude Reef, Hornby Island) and habitat monitoring and scientific data collection there and at a natural bull kelp bed (reference site at south Denman Island). 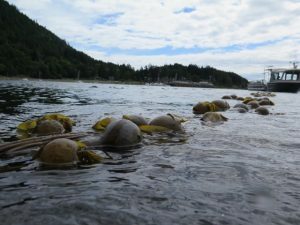 In 2015, the work was focused on the factors limiting the distribution of bull kelp (Nereocystis luetkeana) beds in Lambert Channel and Baynes Sound, a critical nearshore habitat for refuge and feeding of juvenile salmon. A significant database was diversified and expanded on kelp performance under varying conditions at several study sites (including temperature, light intensity, salinity, pH, turbidity and chlorophyll; and under grazing pressure from various herbivore species). 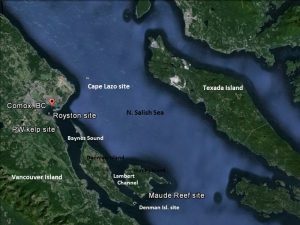 In 2016, with support from Pacific Salmon Foundation’s Salish Sea Marine Survival Project, the project was expanded through a collaboration of Project Watershed Society, Nile Creek Enhancement Society and Simon Fraser University by adding sites in northern Baynes Sound, Royston and Cape Lazo shoal, as well as kelp mapping and developmental biology research at SFU. 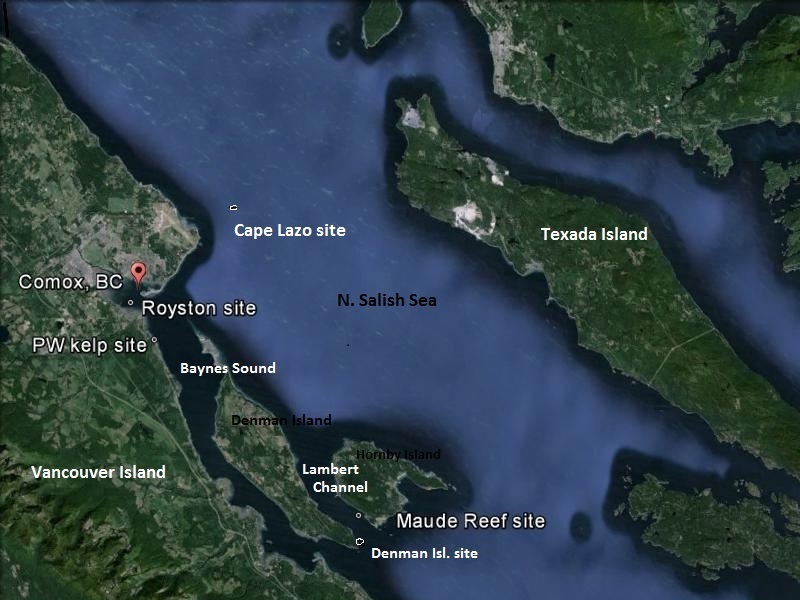 Kelp sporelings from two parent stocks (Campbell River and Sansum Narrows in the S Gulf Islands) were planted and monitored regularly at each of the experimental sites. Data collection was also increased to provide information on the possible barriers to natural recruitment, ecologial interactions and ways to improve restoration methods. In addition to Onset® data loggers for temperature and light intensity at the sites, we used a multi-parameter sonde to collect further environmental data at intervals during the growing season. 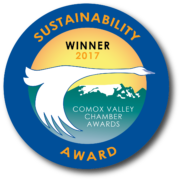 Project Watershed Directors Bill Heath and Dan Bowen were involved in this effort as was the PW Newt, Project Watershed’s boat, which was used for sori collection (2015) at Campbell River and Sansum Narrows; and for genetic sampling in 2016. A further collaboration with a US university has involved collection of genetic samples from kelp beds in the Strait of Georgia for inclusion in a population genetics study of bull kelp from California to Alaska. From these research efforts we are improving our understanding of factors limiting bull kelp distribution and how to restore this important nearshore habitat in local coastal waters. 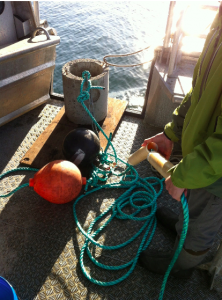 The experimental kelp gear (3 anchors and 2 grow-lines between them) is lowered to the bottom from the dive boat. Seeded twine from the spools wraps on the culture lines as they are deployed. Divers inspect the sites regularly, taking observations on growth and survival and collecting environmental data. Check out the story about this in the new issue of PSF’s Salmon Steward magazine that has a lead article on the Kelp Restoration Project.